With the Pacific Ocean lapping at its shores, the island of O‘ahu is the perfect place for discovering a multitude of rainbow-hued tropical fish. Snorkelers will love the chance to get right in the water with the creatures of the deep, and landlubbers can observe the underwater world without getting their feet wet. Visitors will want to check out these popular stops near downtown Honolulu for some fabulous fish watching. 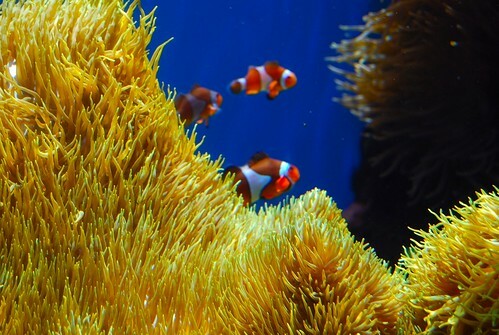 Waikiki Aquarium – Sure to be a hit with kids, favorite sights at the Waikiki Aquarium include a real-life Nemo (technically a Clownfish) and two endangered Hawaiian Monk Seals. At the aquarium, kids come face-to-face with more than 500 species of aquatic animals and plants. Reef sharks? Sea Jellies? You’ll see them here. Not far from Nuka ‘au and Maka onaona – the resident monk seals – the Edge of the Reef outdoor exhibit recreates a profile of habitats you might find along a Hawaiian rocky shoreline. It also features a touch pool where visitors can feel underwater creatures like sea cucumbers and red pencil urchins. Parents with young children will appreciate the wide walkways allowing for easy stroller access. Hanauma Bay Nature Preserve – This idyllic snorkel spot made the news with President Obama’s recent visit to the island, when he and his family had private use of the facility. Happily, Hanauma Bay is open to all visitors, not just those of the presidential sort. The clear blue water of this sheltered bay is home to myriad fish, including Hawai‘i’s state fish, the humuhumunukunukuapua‘a. If you plan to head out into the water, remember that the underwater wildlife here is protected. Don’t touch or feed any of the fish and refrain from standing on the coral.There is snorkel gear available for rent on the beach if you don’t have your own. Parking here can be limited, so plan to arrive early. If you’d prefer to avoid the hassle, ask your hotel concierge about shuttles or public transportation options – there are several. The Oceanarium – Located at the Pacific Beach Hotel, the three-story indoor Oceanarium is a 280,000-gallon aquarium featuring more than 70 different species. Viewing the aquarium is free, or dine at the Oceanarium Restaurant for breakfast, lunch, or dinner (consider trying their Pau Hana Friday special, where from 4:30 – 10 pm you can take 25% off the prime rib and crab leg buffet, and indulge in $3 beers). More adventurous types might want to dive in with Snuba – a combination of snorkeling and scuba diving. No certification is necessary, so most anyone can try it. Dives happen every 30 minutes and are scheduled Monday through Saturday.